Archaeologists have confirmed that the waters of the Bay of Bengal rippled about 13km inland in Contai in the first and second centuries and sea trade supported a large human settlement at Bahiri from the early historic to the Pala period. A team from the Centre for Archaeological Studies and Training Eastern India (CASTEI), an autonomous institute of the state government, conducted exploratory digs at two points near the medieval temple at Bahiri in Contai Block III (a roughly four-hour drive from Calcutta) over a fortnight last month (March 3-17). At depths of 4.5m and 1.5m, they came up with pottery shards, including black, grey and red ware from the early historic period, narrow jars about 50cm tall, which were probably used to transport liquid, beads, large bricks, a saddle quern and decorative terracotta plaques (one with the partial figure of a yakshi) probably dating back to the Sunga period. There is ample structural evidence that a crowded sprawl spread across one square kilometre had existed in the area. “The relic of a paleochannel is further evidence of this being an ancient sea port,” said excavation team leader Kaushik Ganguly. What drew the attention of archaeologists to this site were the legends surrounding a crooked tamarind tree to whose trunk ships supposedly used to be moored and the local lore of anchors and masts being found in ponds. The abundance of pottery and other relics was another major attraction. The Ramakrishna Vivekananda Club, which runs the museum where pottery, fossils and other finds have been kept, has been invited by CASTEI to take part in an outreach programme that will teach them to recognise and conserve the archaeological finds better. The site’s proximity to two other major sites, Chandraketugarh and Tamluk, increases its importance. From nearby Paniparul, a cache of Kushan period coins was unearthed last year. The site, according to Ganguly, is well-suited to excavations. The sea has been retreating in phases, leaving behind wave-like coastal sand dunes parallel to each other and the sea. “Though none of them has been dated, it is easy to see that the latest of these sand dunes is in Digha and the earliest is in Contai. Unlike the other sand dunes, the Contai one has remained largely undisturbed and not too many people live on it because the ground is infertile. In contrast, in Tamluk or Tamralipta, which we know was a major seaport, we have not been able to find anything because a crowded town is literally sitting on its past,” said Ganguly. The ancient settlement along with the temple dating from 17th century and matching late Odiyan temple design could make the area a tourist attraction. A plaque on this terracotta temple bears an inscription in Odiya mentioning a person named Bhimsen Mahapatra. The team has decided to return to the site next year for more large-scale excavations. “So far very little is known about the geological history of the delta’s coastal configurations. We have vague ideas but no concrete proof. This site could reveal a lot of new data if we could get all the evidences accurately tested and analysed by experts from other disciplines. We have along with antiquities taken sand samples at various depths for analysis,” said Ganguly. 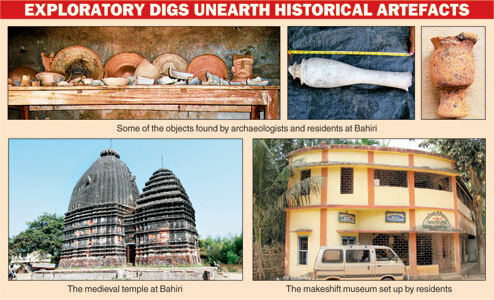 “Bahiri is an important site and we await a full-length excavation,” said the director-general of the Archaeological Survey of India, Gautam Sengupta. CASTEI, which came into being in 1995, promotes multidisciplinary research in regional archaeology, provides training and spreads awareness on the subject. The organisation, headed by Krishna Bose, conducts seminars, exhibitions and workshops. It publishes a journal, Pratna Samiksha, and has conducted excavations at Mangalkot and Birbhum.